Eligible for NHPC, RMTA, MTAA, MTAM credits. What to expect at the Workshop ? Aspects of Reflexology have been adapted to give the Massage Therapist the opportunity to incorporate specific Foot Reflexology techniques to promote circulation and muscle balance. The therapist does not need any prior knowledge or experience in Reflexology; as the training is adapted for massage therapy. These Reflexology skills add to a therapists’ knowledge base, therapy skills and body/mind awareness approach to a therapy session. · Foot Reflexology techniques to address imbalances along the spine and the shoulder/pelvic girdle. Included is a comprehensive 45 page workbook and practical sessions to ensure the participant can apply the skills with confidence. 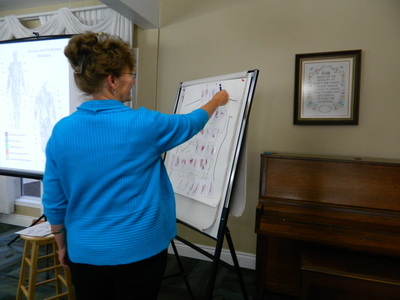 Although this workshop is aimed at Massage Therapists, there are aspects of the workshop that do not form part of the traditional Reflexology training. A Reflexologist in training would also find this workshop invaluable. Please contact me for further information or questions. I found this course very informative. ​ I feel it's so important that someone who is teaching have the ability to accommodate a variety of learning styles as we all learn differently. Very Knowledgeable! Designed well for Massage Therapists. Can't wait to use it on my clients.